How easy is it to travel in Tehran? Hi, how easy is it to travel in Tehran? i am planning to visit some Iranian airlines' offices in Tehran in 2018. Are the public transport equipped with signs in English? How much do land transport travel in Tehran from the airport cost? Do Iranians speak English? I am from Singapore. 1. It's quite easy to travel in Tehran but just keep in mind that Tehran is a cery busy city and traffic can be a disaster over there especially during rush hours. 2. Public trasports don't really have English signs, however if u use underground you can see names of stations in English. 3. The costs of taxis from IKIA (International airport in Tehran) to any destination in Tehran are fixed and it's a bit less than 20 euro for one way. 4. It's depends whom you talking about, generally Iranians are not very good with English, however, if you talk with young people, they can help you although maybe their English is not perfect. 1. If I were you I used official Taxis in Tehran to go around, they are not very expensive and they can go anywhere, they have are yellow cars and in my opinion the best option will be this: just arrange with one of them and make a deal to hire him for the period which u r there in Tehran, it will help him and you both. He get good money and u will be in all destinations that u want fast and without any problems. 2. Generally, Iranians are very nice people and although you will find lots of them can't speak English very well but for sure they will do all their best to help you in any way that they can. 3. Don't forget about traffic jam in Tehran, it's a disaster!! Hi, Siavash, I would like to visit these airline offices in Tehran: 1. Aria Airlines at Ekbatan. 2. Caspian Airlines at No. 5, Takhti Square, Dr. Behesti Avenue. 3. Kish Air at Opp. Rahahan Stadium, Ekbatan. 4. Qeshm Air at 11th St, Gandhi Avenue. 5. Saha Airlines at Saedi St, Karaj Old Riad. 6. Mahan Air at Mahan Tower, Azadegan St, Karaj Expressway. 7. IranAir Tours at Mofatteh Junction, Motahari Avenue. Are the above addresses easy for taxi drivers to reach there? 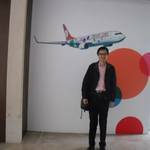 Aria, Kish, Mahan, Saha Airlines (Be care that Mahan air has its own building and I suggest first visit that one and then Aria and Kish and after these Saha airline. (just to know, Aria and Saha are not very good airlines), Mahan is much better and Kish is good too. Caspian and Qeshm airline, and first go to Qeshm airline and after that Caspian. - For Iran air, I'm not sure about this address and check it one more time, because Iran Air has a lot of buildings and their main offices are in Mehrabad International Airport. I suggest to check one more time, to me this address is seems to be a travel agency or their ticket sell agency, I'm not sure, check it. I am looking to collect the inflight magazines of Aria Airlines, Kish Air, Saha Airlines, Qeshm Air, Mahan Air and IranAir Tours and their brochures. I could not get them at their offices in Dubai and Bangkok. As per your encounters with these airlines in Tehran, are the inflight magazines available in their Tehran offices? I also want to collect Caspian Airlines inflight magazine in Tehran.